Today, please welcome John Bauer and Y 6093 to Ys on Parade. John lives in Florida and suffered badly with the hurricanes in 2004 - particularly IVAN - his Y didn't fare too much better, so I am encouraging him to go for it and restore the car! Good luck John and we will support you in whatever way we can. While I was bidding on the February 1953 price list I was also bidding on one from October 1951. The successful buyer and I have exchanged scans so we are also able to add the October 1951 Price List to the Brochures page now too. Also today, please welcome John Whipp and Y 5883 to Ys on Parade. As the photograph of his car is also of a wedding, he has provided details to add this to our Ys at Weddings page too. Just in and added to the Brochures page is a Nuffield Organization English Retail price list from February 1953 for your interest. Hot off the press - we have two reports from the 2005 Spring Run, from Andrew Adamson and Ted Gardner. Thank you gentlemen, wish I could have joined you. An eventful month with much going on this month - as we breach another milestone, over 55,000 visitors to the site, and in only just over three years. In celebration we have added a new Collectible for your interest. Earlier this month, Andrew Coulson kindly sent me a detailed report on his Jackall pump refurbishment. Click here to read this report. Hopefully the weather has turned out fine for the UK Spring Run and everyone will have a good time on this great event. I sit here sad that I cannot go, but will try to make up for it by doing an update to the website instead. We are able to bring you the rally plate from the event and this can be found on the Artist's Impressions page. 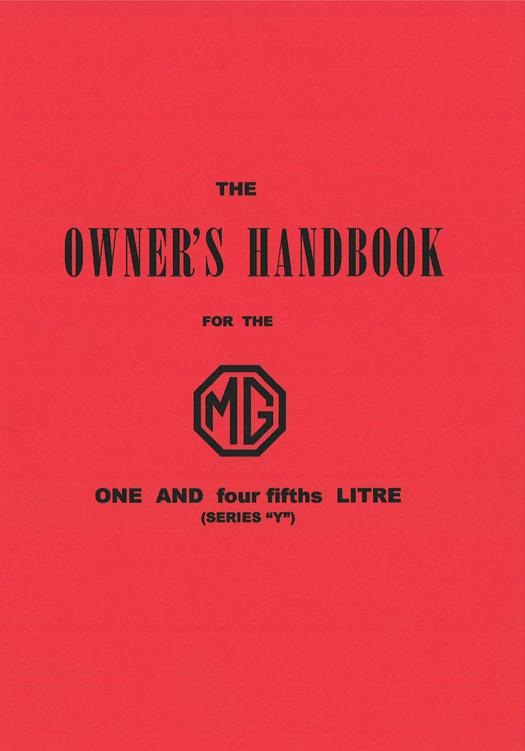 Well, it is the third birthday of the website and in keeping with previous years, a small present to everyone, I obtained an original copy of an article that featured in the Scottish Daily Express on 20 June 1947 - probably one of the earliest press reports on the MG 1 1/4 Litre, and they have very kindly consented to us to use it on our site under Reprinted Articles. This was in the same edition as the advert we brought to you earlier this month. Also, as promised on the 15 April, an interesting twist on the original sales brochure has come to light - it isn't, as a matter of fact, the original after all! There is an earlier version with the interesting addition of the word NEW in the title, and yet another version of the colour chart! See the Reprinted Brochures page for details. To round off today, I have put up a further two new Reprinted Advertisements. Sadly I cannot advise on the dates or confirm the publications, but one is a half colour version of a 1953 style Dual Personality, and the other I believe is an early Maintaining the Breed. On the cusp of the UK MG Car Club Spring Run, we wish everyone a very happy and safe run. No doubt we will be getting a report and some photographs in due course, and hopefully they will have better weather than last year which was the wettest day of the year. Meanwhile, here is the mid-month Reprinted Article to keep you going. We are also only 2 days away from our third birthday on the site so keep coming back and see what else is as we have an interesting development of brochures to share. We have also added Autospeed and Components Direct to the links page as suppliers of captive nuts - a very frustrating but vital component to anyone putting a Y back together after a rebuild. Finally for today, please welcome Ray Hanson, who is the new owner of Y 2870 to Ys on Parade. I recently obtained a new contemporary advert which has been added to the Reprinted Advertisements page. Although the overall theme is already posted, this one is interesting in that it was placed in the Scottish Daily Express on June 20 1947 bearing the subscript of a local dealer in Dundee - is the dealer still going I wonder? Any Scottish owner care to check it out for me please and let me know? There will be more from this same paper later I hope! Robert Simpson has kindly shared with us four spectacular Collectibles from 'down under' harking back to the days of the Golden Jubilee Anniversary of the Birth of the Y - thank you Robert. Vehicle keepers who have not received the new certificate and do not need to tax their vehicle, or make SORN by June 2005 and want one can do so by returning their V5 registration document to DVLA Swansea SA99 1BA with an accompanying letter. From 1st July 2005 all existing V5 registrations documents will no longer be valid. This will not affect entitlement to registration marks. Motorists who have a valid claim on a vehicle and it's registration mark will not be disadvantaged . The V765 Scheme which enables old vehicles to be re united with their original registration marks, will be unaffected by these changes. Following up on a recent Bulletin Board thread on the gear box interlocking pin, Bill Bennett sent in a full report of the solution to his problem. This has been added to the Technical Advice section. Ian Theobald has sent in a new picture of his YT 3471 for Ys on Parade. Sadly Ian is selling this stunning restoration as he wants a longer legged 2 1/2 litre Riley. He says, "The hood still needs completing but old one is useful for pattern. I have been using a full tonneau as we have had little rain until recently. The car now has new leather trim and carpet copied as close as possible to original from what scraps people loaned me. The motor I believe has been rebuilt prior to my purchase with upgraded cam and head valves as per the MG TF, and has s/s exhaust which sounds great at just over 4000 revs. Asking price is aus$19,500. I can be contacted at home on phone number [Australia] 0244641750 or email me here when my computer returned shortly from being fixed. Too late for me to use on you as an April Fool (apologies for the late update last night my time, but I got stuck overnight at work and couldn't update overnight 31 March), but Richard Prior sent me this new "Collectible" for those of you who thought they were the first to up the power in their Y - it seems the MG Car Company thought of everything - as early as 1950 and beat everyone to it. Goldie Gardner was not alone in increasing the power of his Y Type. A good laugh! Finally for now, the committee line up of Ys on Parade is completed by the addition of Paul Gresser's MG YB so please welcome Paul and YB 1446 to Ys on Parade. Thank you Paul. Seventeen days to go to the Spring Run so sign up and send in your entry forms now please! Also, at the beginning of a new month, please welcome Andrew Gilham and Y 5924 to Ys on Parade. Andrew's car is the 50th YA from the UK! Thank you Andrew. Picture of the Month this month is clearly not for the purists: it is a picture of Phil Stafford's Y Special YT 4608. Finally, this month's first Reprinted Article is from Restoring Classic Cars, November 1988 and describes Brian Hunt's restoration of his YA.